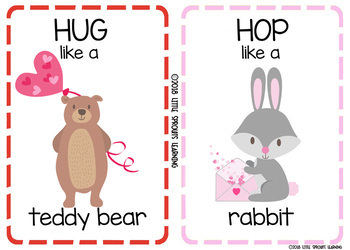 Holiday Movement Cards BUNDLE- St. Patrick's day, Easter, and more! 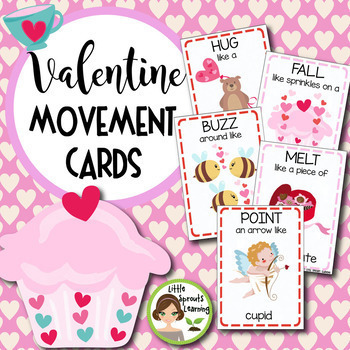 These Valentine themed cards will keep students active while teaching them about different actions, improving their gross motor skills! 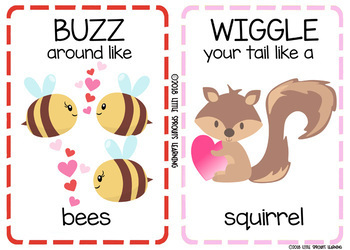 Simply print on card stock, cut out and laminate. 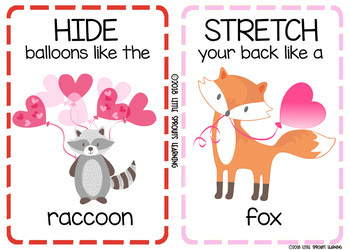 They can be kept handy on a binder ring. Each card is large enough to use in a group setting. Cards feature: mouse (in heart tea cup), love bird, teddy bear, rabbit (holding card), cuddle fish, owl (holding a heart), Raccoon hiding balloons, fox, bees, squirrel, flowers, Valentine cupcake, hart shaped balloons, tea cup with heart, koala (holding heart) climbing tree, dancing love bugs (lady bugs), cupid, box of chocolate, robot with hearts, leaping frog with heart, chocolate strawberries, Valentine cookies. NOTE: I have revised this product effective October 3, 2018 with six additional cards for a total of 22 cards. Each time you give feedback, TPT gives you feedback credits that you use to lower the cost of your future purchases. I value your feedback greatly as it helps me determine which products are most valuable for your classroom so I can create more related products.